Anti-bacterial. Naturally derived. Kills 99.9% of bacteria. Certified cruelty free. You think you're so smart don't you? Well... you are, okay? You win. Anti-bac, but not as you know it. You're gonna love this... There's a new anti-bac in town and it's made with a new naturally derived lactic acid formula that tough on grease and grime and easy on surfaces. Plus, you'll be happy to know that it kills 99.9% of bacteria*, leaving behind a fresh scent and a smile. *Including enterococcus hirae, staphylococcus aureus, escherichia coli, pseudomonas aeruginosa. 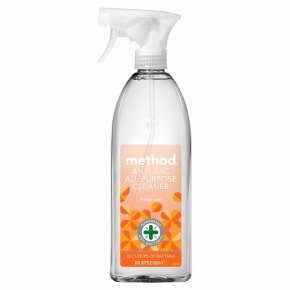 Easy to use: Spray on surface. To disinfect, leave to work its magic for 5 minutes. Wipe with a damp cloth. Kitchen surfaces, high chairs, bins, chopping boards Psst: test in an inconspicuous place first. Surfaces vary. Not suitable for use on natural stones or porous surfaces, such as marble or limestone.